The mission of Chicago Tube and Iron Company is to provide our extensive line of products and value added capabilities with best-in-class service. We will do so in a manner that provides long-term profitable growth to sustain our company with appropriate investments in talent, assets, and technology to meet the ongoing needs of our customers, employees, shareholders, and suppliers. We will always do so with uncompromising integrity and with the utmost regard for the safety of our employees. To attain the highest levels of customer satisfaction, achieved through operational excellence. Integrity – We are honest and ethical in all our business dealings, starting with how we treat each other. Our personal conduct ensures that Chicago Tube and Iron’s name is always worthy of trust. Safety – We are committed to providing a safe work environment and promoting employee health and well-being through continuous education. Accountability – We accept responsibility for achieving targeted goals and objectives. Corporate Citizenship – We value the communities where our employees live and work. We recognize the importance of “family” and strive to balance our work and personal priorities. Customer Satisfaction – We take great pride in exceeding our customers’ expectations. 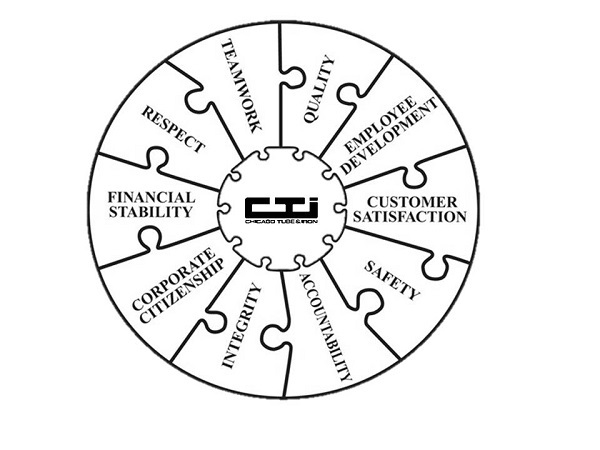 We build enduring relationships by anticipating, understanding and fulfilling our customers’ needs. Employee Development – We support personal growth and continuous learning whether in the classroom or through on-the-job training. We encourage employees to accept new challenges and to demonstrate individual initiative. We are committed to providing performance feedback and coaching in order to bring out the best in our employees. Financial Stability – We are committed to maintaining economic strength and long term viability for the benefit of our employees and shareholders. Quality – We are committed to identifying and eliminating the sources of error and waste in our processes. We believe that quality excellence is pivotal to our success. Respect – We treat each other with honor and dignity, while valuing individual and cultural differences. We communicate frequently and effectively while listening to each other regardless of position. Teamwork – We value and reward both individual and team achievements. We encourage employees to cross organizational boundaries in order to advance the interest of customers and shareholders. By living these core values, Chicago Tube and Iron will set a standard of excellence that rewards our customers, our employees and our shareholders.